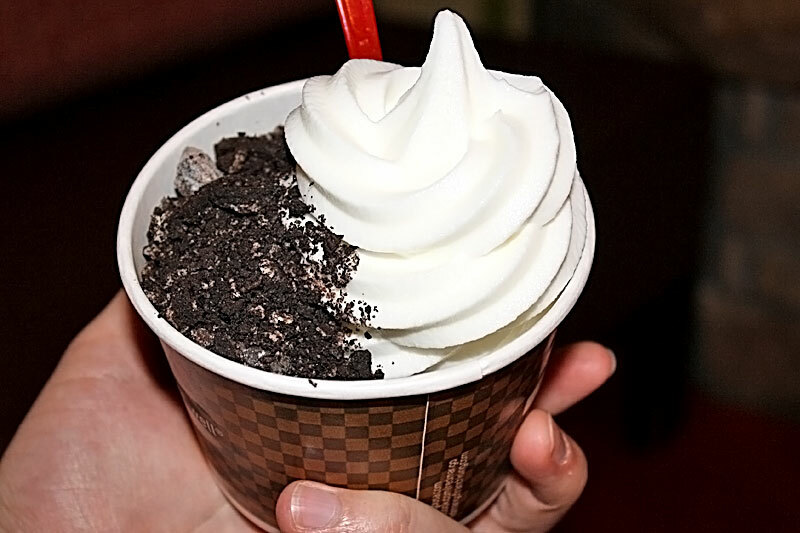 Oh, the fro-yo trend. "Healthy" ice cream? Maybe not, but it is certainly delicious. We've been Yogurtland die-hards over here for the past few months, but when we tried to go there one night, it was so incredibly packed that we gave up and decided to try somewhere new. 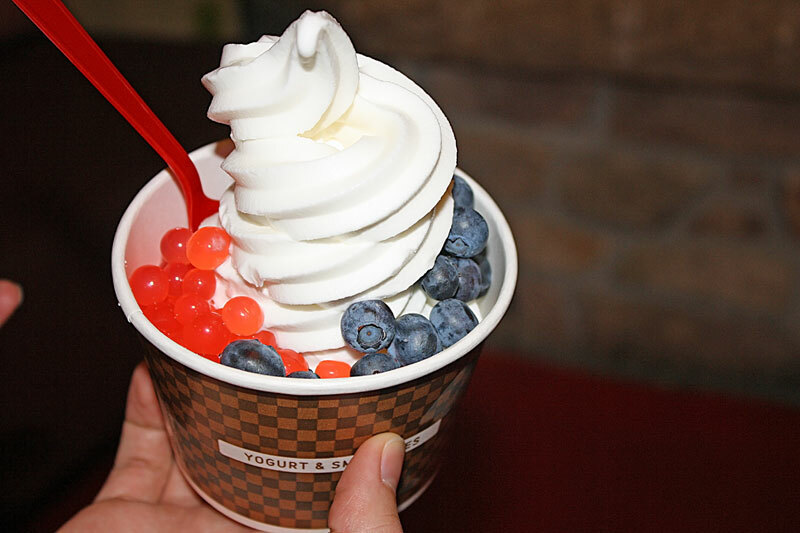 I was interested in Red Mango Frozen Yogurt because I had heard some people say how great it was, and some people call it "the expensive yogurt place." Why would anyone pay more than 40ish cents/ounce? I needed to know. When we got there, I immediately liked the warm atmosphere and we were helped relatively quickly. Of course, there weren't many other people there, so I'm not sure how the customer service is on a busy day. I was a little disappointed that they only had three flavors of yogurt to try - I'm used to the 10 or more flavors of normal places. Owen went with the plain yogurt and got some chocolate-y toppings to go with it (we wanted to see if their original flavor tasted weird with chocolate, like some places do), and I got the white peach yogurt with my favorite little popping bobas. Seriously, if you've never tried these things, you really should. They are like little fun flavor explosions in your mouth! Definitely the most fun food item I've eaten recently. We both ordered regular sizes, and I was pleased to see that they were actually pretty big - I would probably get a small next time. I was a little disgusted that it cost $1 for the first topping. "This stuff IS expensive!" I thought, so we each only got two toppings (which they serve for you, you don't really get to pick the amount you want. Fortunately they were pretty generous). When they rang up our order, I was surprised to find that the total cost actually wasn't that much more than what we spend at any other yogurt place! Sweet! We went to sit on the couches by the fireplace (kind of fun in the wintertime), and took our first few bites. Wow. This was definitely the best quality frozen yogurt I've ever had. The white peach flavor was amazing - creamy, smooth, and such a crisp delicious flavor. I only let Owen have a tiny bite of mine because I honestly did not want to share any of it, it was so good. The blueberries were all fresh and sweet, and I realized why people might go to Red Mango. Owen's original flavor was also wonderful. The plain yogurt complimented the chocolate flavors nicely, and he was more than satisfied with the Oreos and brownie flavors. What You Should Do: Go! 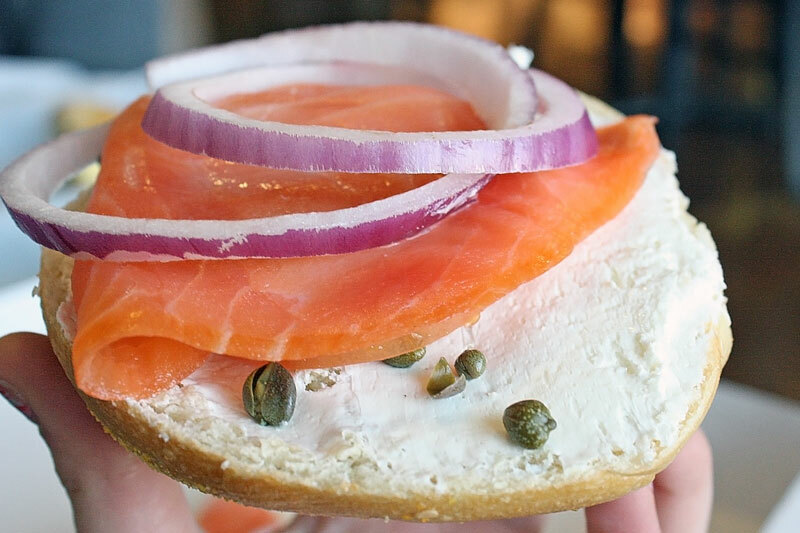 But not if you are the type of person who loves to load on lots of different kinds of toppings or mix flavors. If you like clean, basic and simple flavors, or usually order heavy toppings (like strawberries and other fruit), then Red Mango may be the best shot for you. The yogurt itself is amazing, and even though they have few flavors, they are delicious ones. If you like to mix 1/4th oatmeal cookie, 1/4th chocolate milkshake, 1/4th cake batter, and 1/4th red velvet plus Reese's, coconut, Kit Kat bars, Oreos, and caramel syrup for your frozen yogurt treat (maybe I've done that before...who knows...), then you'd be better off going to Yogurtland or somewhere else. Thanks to presidents, we had a three-day weekend and decided to take a little road trip on our Monday off up to Park City. Of course we wanted to go out to lunch, so I checked out our good friend Urbanspoon.com to get a recommendation, and decided to go to the #1 highest-rated restaurant in Park City. Should be good in a city known for having lots of good restaurants, right? 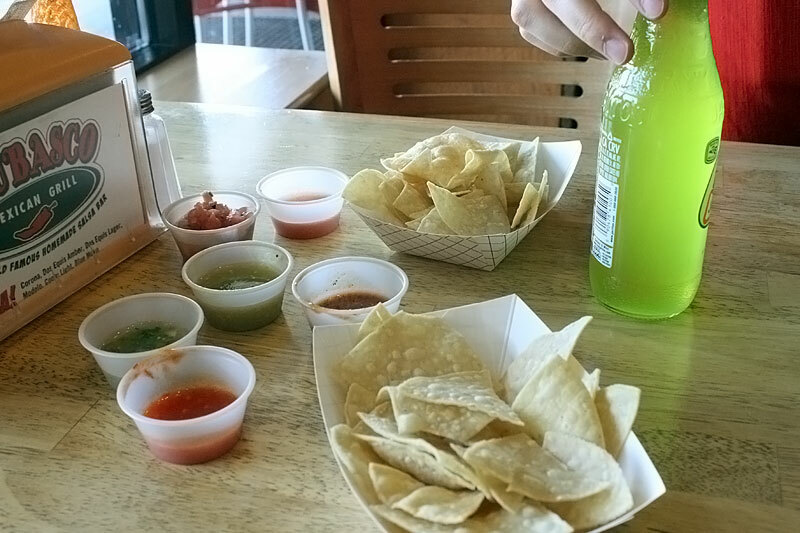 The salsa bar (shown above) is what many of the reviewers raved about. I admit that it does have a really broad selection - more salsas than you could even try, and hot pepper ratings shown on the signs that help you know the spiciness level. But really, none of them tasted any better or more special than something I could get at the grocery store from Herdez. It arrived quickly, which was good, but if you read carefully above, you would notice that this burrito was indeed not covered in rojo salsa. They must have thought that Owen wanted salsa verde, so we were a little disappointed that they got his order wrong, but we were too hungry to send it back. Halfway through the burrito, Owen wished that he had done differently, but by then, what could we do? Anyway, the burrito indeed was BIG. 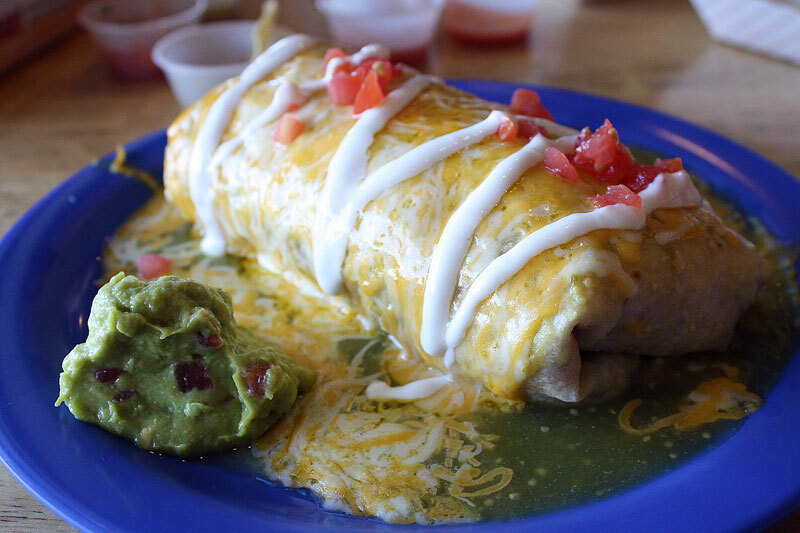 You certainly get your money's worth with this burrito, and it is filled to the brim with meat. If only the meat had actually been good....the carne asada was sadly really dry and not very flavorful. 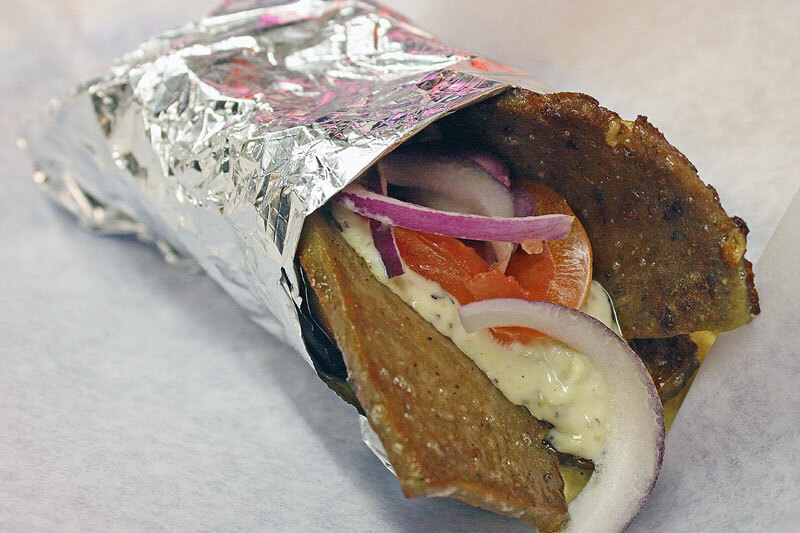 If you want to eat just to get full, then this may be a good option for you. But we were disappointed that we paid for extra sauce and got the wrong kind, and then the insides of the burrito were so dry and boring. The combo plate looked promising, with lots of fun colors and good presentation. I started off with the carnitas tacos, and honestly, I was so hungry at this point that I can't really remember what they tasted like. They weren't amazing, but they weren't horrible either. 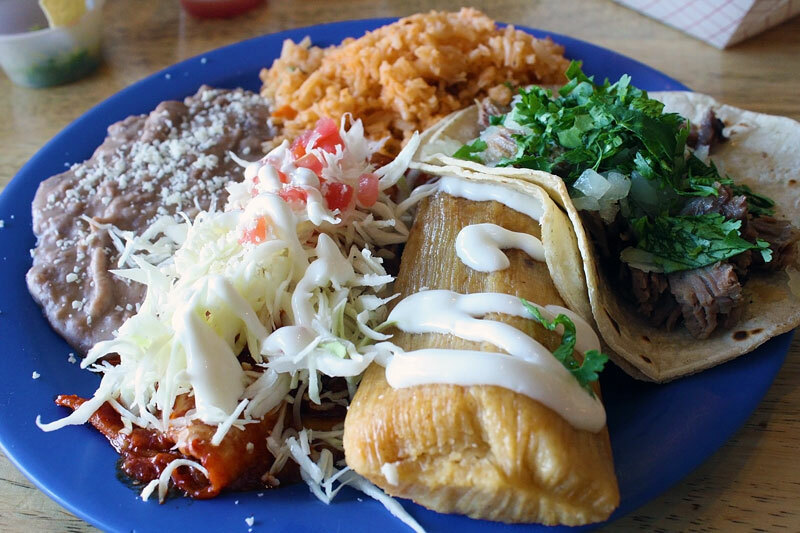 Then I moved on to the tamale - another reviewer said that their tamales aren't that great and that they wouldn't order them again, but it was actually my favorite part of the whole meal! The corn exterior was soft and good consistency, and I enjoyed the overall flavor. The enchilada was the skinniest little enchilada I've ever seen! They hide it under a mountain of cabbage so you can't tell how tiny it is, and it was filled with incredibly overcooked chicken. The beans and rice were an expected complement to the meal, but they weren't the most savory I've ever had. What You Should Do: Go if you have to. I think that the only reason that this restaurant is rated so highly is because it's in Park City, and it's probably the only place you can go without feeling like you're completely breaking the bank. Plus the salsa bar is kind of fun. The portion sizes are very large, and it is pretty reasonably priced despite its location, which may be what you are looking for when hungry after a day of skiing. But is the food the best Mexican I've ever had? Far from it. We didn't even want to take the rest of Owen's burrito home. I feel like since I love wings so much, I should start a new weekly thing -- Wings Wednesday! Just kidding, we don't eat wings nearly often enough (or maybe we do...and I just don't want to admit it...), but in any case, here's some details about some of our favorite wings, on a Wednesday! 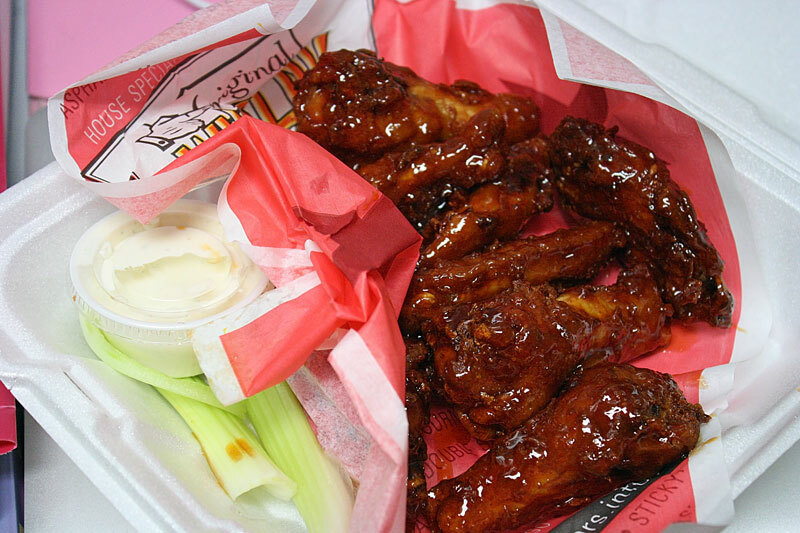 Whether or not you will like Winger's is all based on your wing preferences -- if you hate any kind of sweet sauce on your wings, and prefer them straight up with buffalo sauce or something, then you will probably not enjoy the original wings. However, if you like them sweet and sticky and saucy like we do, you will love them! We got these 8 piece original wings to go one day after some shopping at Provo Town Center mall. Best decision ever. We inhaled them in literally 15 seconds. Okay, not literally, but it was a little embarrassing how fast we ate them. I have to admit, the service at Winger's is not always the greatest. When we dined at the store on State Street, our server was very inattentive, rolled her eyes behind our backs when we asked more popcorn (which they serve instead of breadsticks or something), and took forever to refill our water even though our mouths were ON FIRE after the hot buffalo sauce. If you're looking for a great experience, this may not be the place, but you can just do what we did and get the original wings to go. You will be very happy. Also, the boneless wings kind of felt a little lame and chicken-nugget-esque after eating the regular wings...if you're going to go for wings, go all out and get the messy kind. Though if you are dining with children, the boneless may be an easier option. 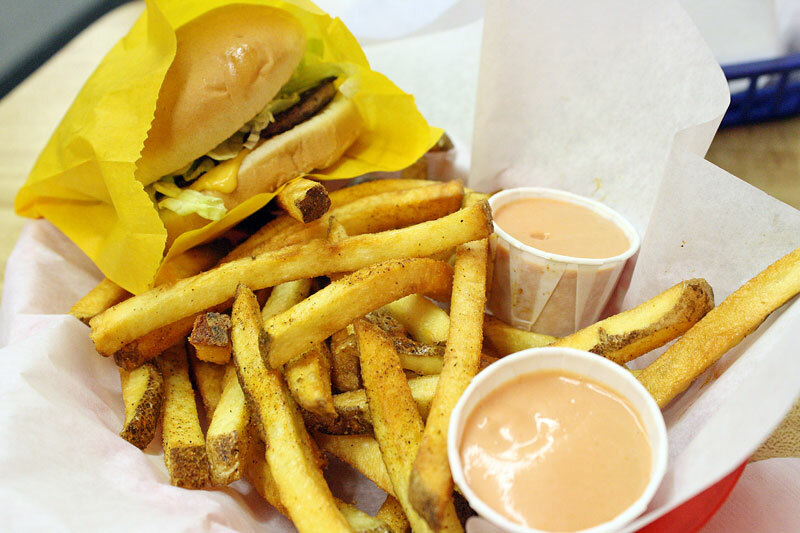 What You Should Do: Go. But know you probably won't have the best service and you're just there for the wings, honestly. The rest of the menu isn't anything special, but they are called Winger's for a reason. There are a lot of Mexican places around here -- some great, and some not so great. Unfortunately, Bajio Mexican Grill falls under the latter category for us. 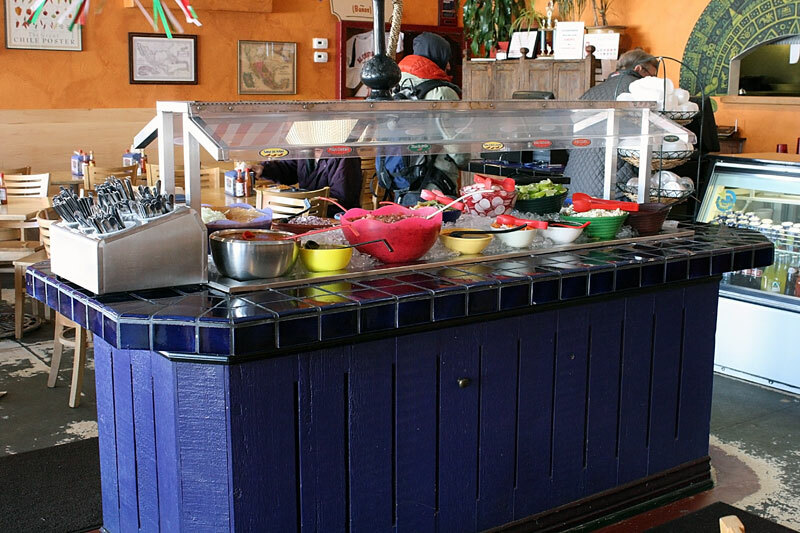 We originally wanted to go there because we loved Cafe Rio, and it seemed like a similar type of "fresh Mexican" type of restaurant. They do have a couple more options, which sounded exciting, and it was wayyy less busy of course. We were able to order our food quickly, though it was prepared rather slowly (though I guess anything is slow compared to the roller coaster ride of Cafe Rio...), and was unimpressive when we sat down with our plates. The burrito was dry, and the salad was rather bland. I was expecting loads of juicy meat and fresh toppings, but what we got was sloppily assembled and even worse than Costa Vida. What You Should Do: Go if you have to. The place is a lot less busy than Cafe Rio, so you'll probably get food faster, but you won't be as satisfied. The prices are about the same, but the quality is very different. 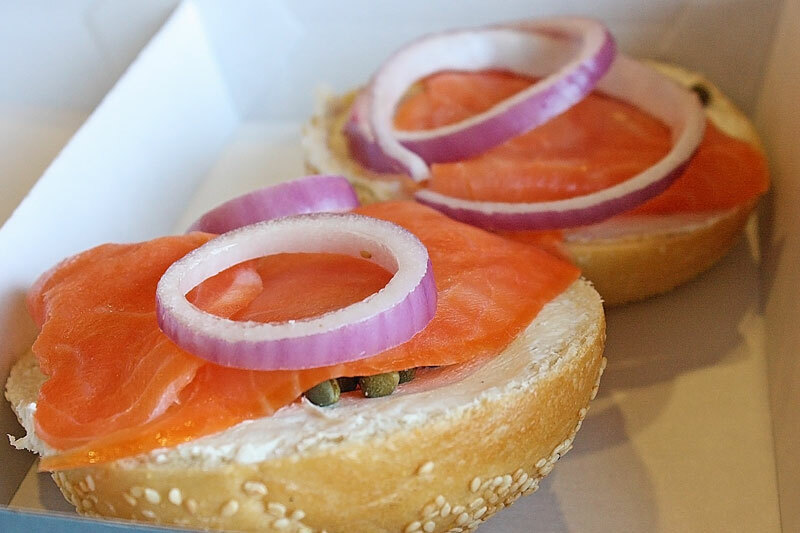 Owen works pretty close to their location at the Riverwoods, which would make for a convenient lunch, but we've never been tempted to go back there again. Want to go somewhere a little nice without completely breaking the bank? La Jolla Groves is your best bet in the area near BYU. They have a wonderful atmosphere with fake lemon trees covering the tables in the main dining area -- okay so that sounds kind of lame and cheesy, but I really like it and think that it is fun. The service is the best. This year, I let Owen plan Valentine's evening. He thought that La Jolla Groves would be a great place to go, but of course, so did lots of other people in Utah Valley, and he didn't realize that we would need to make a reservation. When I realized that he hadn't made a reservation, we called the restaurant around 5:45 and asked how long the wait was. They said it would be about a half hour, so we figured we'd give it a try. When we arrived at the restaurant, we put our name down and the hostess said that we probably would not be seated until around 8. Surprised, we told the hostess that over the phone 5 minutes ago, someone had told us that the wait was 30 minutes, not 3 hours. The restaurant was pretty busy, of course, but she said she would try to fit us in as quickly as she could. 15 minutes later, we were seated! It was awesome! I was so glad that the staff at La Jolla Groves were able to make our Valentine's dinner still perfect even though we didn't have a reservation! 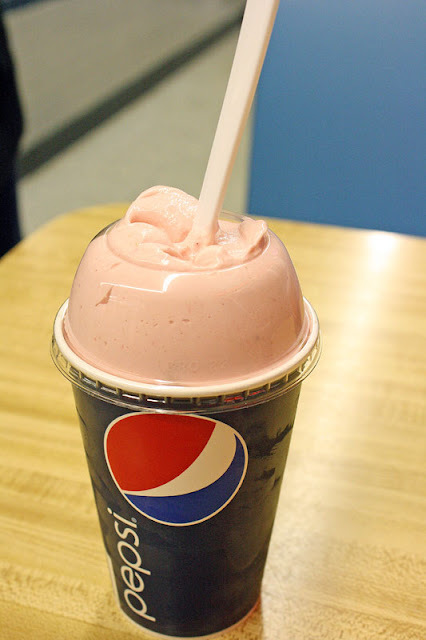 Owen is a huge fan of Italian sodas, and they make some of the best. Last time we went, our server recommended his favorite, the hazelnut Italian soda. 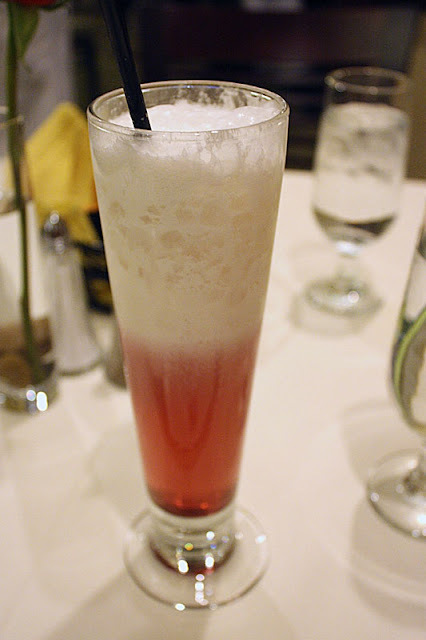 It was a little strange flavor-wise, but still the best Italian soda I'd ever had. This time we got the blackberry flavor, and it was even better! They make these delicious sodas just perfectly. 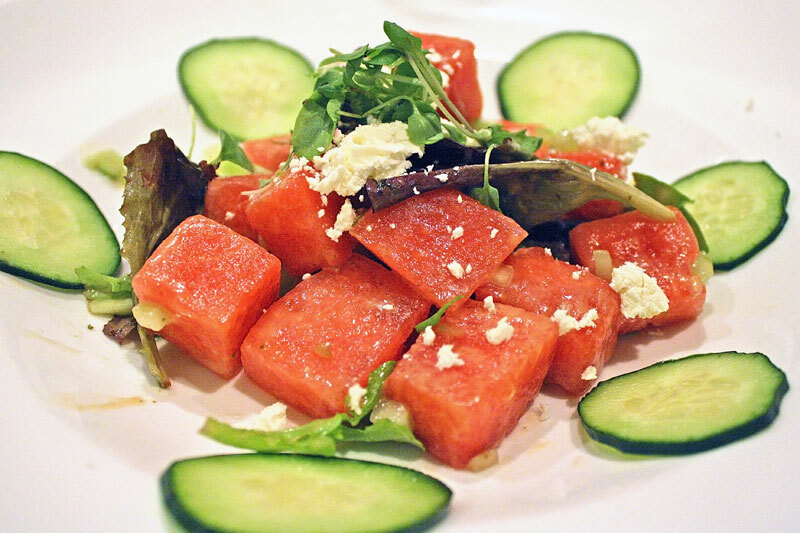 The watermelon salad is my all-time favorite. Keep in mind that this is just a half-salad - they split it for us without even having to ask! Even though it's not really in season, the watermelon was juicy and crisp, and I love how it is paired perfectly with the mint dressing and cucumber. So refreshing. So wonderful. 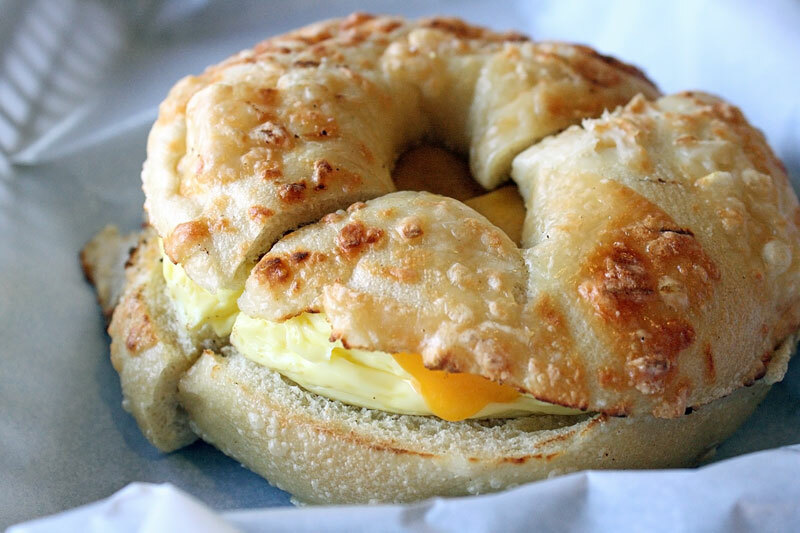 I could eat this every day. The one thing I would change about La Jolla Groves is the fact that their menu does not change that much. They claim to use fresh, seasonal ingredients, but last time I checked, watermelon is not in season in February (though it was still delicious, don't get me wrong!) We came here for the first time last summer, and from what I can tell, the menu has not changed all that much. They still offer the same entrées, same pastas, same everything, which can get boring if you plan on coming here more than twice. I also would never order a sandwich for dinner, so that knocks off a big portion of the menu for me. They have a lot of different pasta options, but you've heard me rant about pastas before -- it is rare for me to find a pasta where I don't think, "Hmm...I could have made that so easily at home. For way less." That sentiment was true when I ordered the Pesto Chicken Pasta last summer, and was sadly true again with Owen's tortellini. 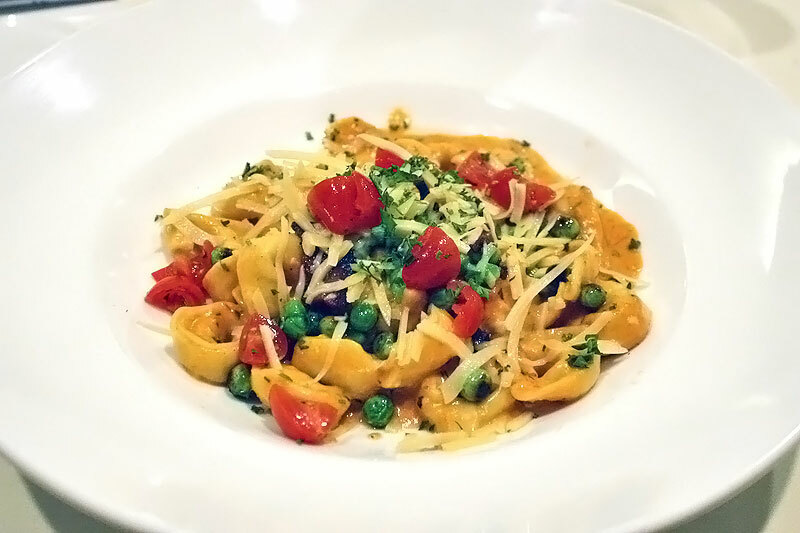 While the tortellini claimed to hold inside its little shell a variety of cheeses, including ricotta and mascarpone, it was hard to detect anything beneath the tomato sauce. At least the sauce was enjoyable -- it tasted like it had flavors of bell pepper as well, and was not too heavy. The vegetables were a little limp and weren't super vibrant, but at least they didn't overdo it with the applewood bacon like so many other places tend to do. I definitely got the better of the two entrées between the two of us -- the salmon was perfectly cooked, very fresh, had a wonderfully crisp crust, and was a good portion size. 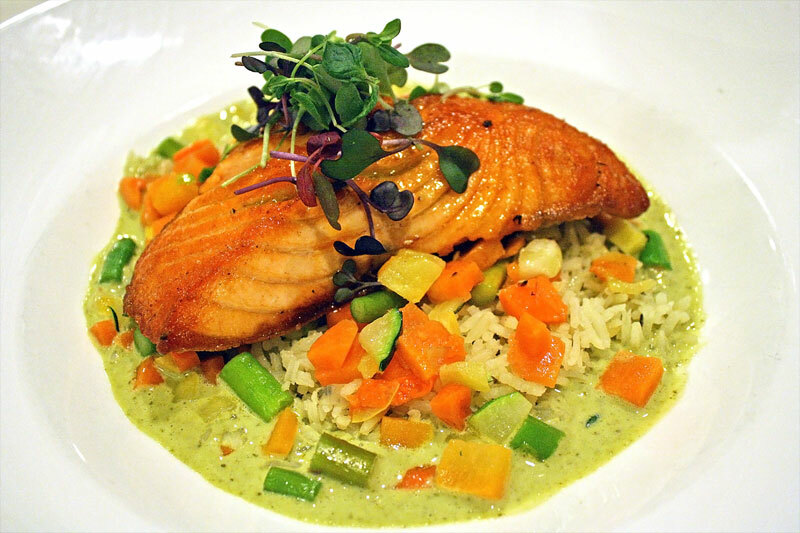 I also loved the cilantro butter sauce it was served with, and the basmati rice was cooked to perfection as well. The vegetables it was served with looked vaguely familiar...I'm pretty sure that it is the exact same (or super close) mixture of vegetables that was mixed into my pesto chicken pasta last summer? Last summer, Owen also got the chicken marsala, which was a good choice, even to me, the mushroom hater. Along with my (not-so-) secret obsession with hot wings, another food love of mine is anything citrus flavored. I've always asked for lemon cake on my birthday (much to the despair of all my other family members), and La Jolla Groves has the ultimate selection for fresh, delicious citrus desserts. On our first visit, we ordered the La Jolla Groves Lemon Cake, a little lemon bundt cake served with crème anglaise, a little caramel dome, and berries & mint. Wonderful. It was incredibly moist, sweet, and adorable to boot. This time we ordered the orange crème brûlée, since Owen never has had it before, and I have to convince him of why I should purchase a kitchen torch. It had great flavor, but I was a little disappointed because in the custard portion of the dessert, there were lots of little pieces of orange zest which disturbed the creamy texture I was hoping for. 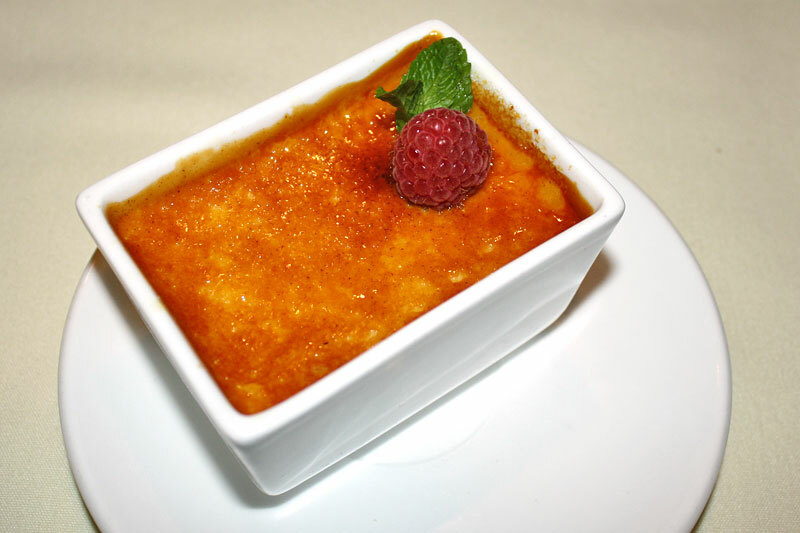 Owen still loved it, but when I order crème brûlée, I want smooth and luscious bites, not little chunks of whatever in it. But if you're not as big of a texture freak as me, you will probably still love it anyway. I still want to try their lemon tiramisu and lemon rolls...never enough lemon for me! I feel like I've been cheating on you all by holding out on this awesome restaurant for a week, but here it finally is! When I was making my list of restaurants we've visited, I realized that we don't go out to eat Asian food all that often. I have no idea why, I like lots of different kinds of Asian food, but I think sometimes I am just scared to try something I am not sure I will like. Plus I have some irrational fear of any kind of Asian seafood here in Utah, because, well....who knows where that "fish" came from, right? In any case, we haven't been to a lot of Asian restaurants (spending most of our time getting pizza and wings...hmmm....), but I am glad that of all the places near BYU, we went to Sora first! When we went to Two Jack's Pizza, I noticed this new restaurant on Center Street for the first time. It wasn't open yet, but I was determined that we would try it once it was! I love visiting new restaurants that aren't super popular yet (so hipster of me...) because they usually are not busy and the service is really friendly and great. This was absolutely true of Sora -- when we arrived, we were offered three different seating options: main dining room table, private dining room (no reservation or anything needed! ), or private Japanese-style dining. We chose Japanese-style dining of course, removed our shoes, and went to sit on the lovely wooden floor at our table. The restaurant location used to be a bridal shop, so it has some unique and pretty interior decor. Our server was a little new and awkward, but she was very nice and tried to anticipate our needs. 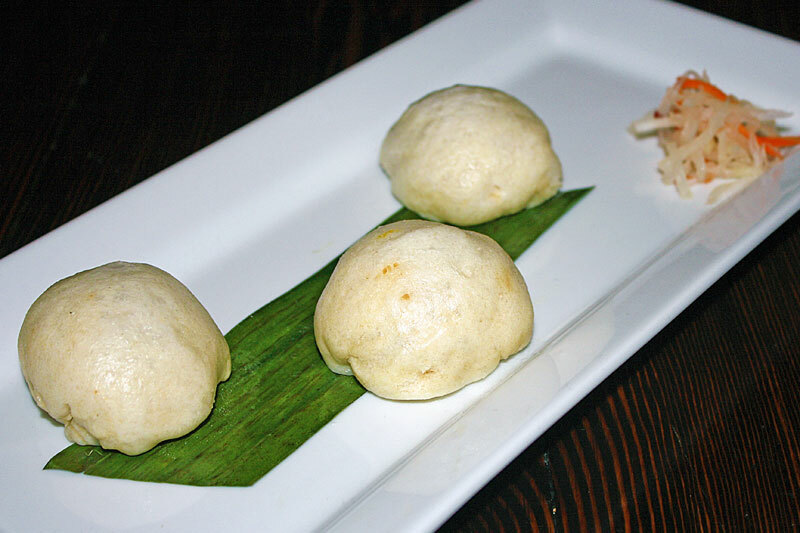 We started off with some barbecue pork steamed buns as an appetizer, which were just right. They were soft and sweet, and the pork filling was enjoyable. I liked the little slaw that it was served with, and it was all very aesthetically pleasing. I feel a little lame because I went with all "safe" dishes, but I wanted to get something I was familiar with so that I could compare it to others. 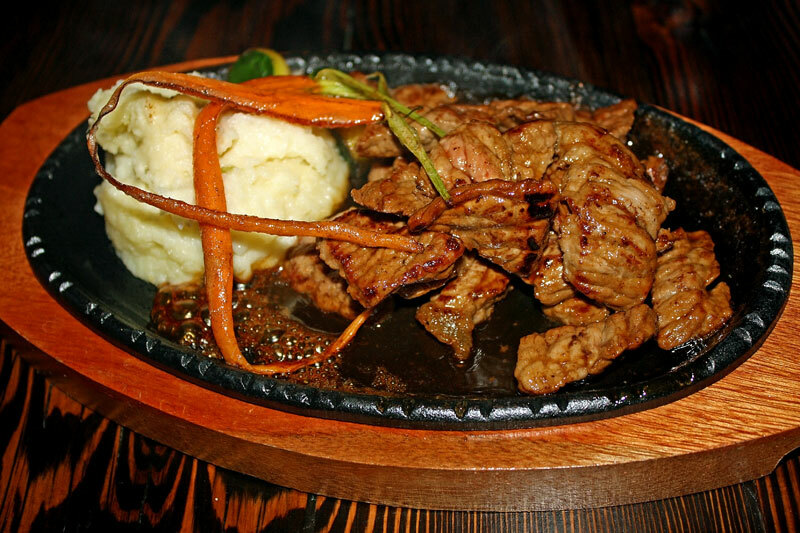 I ordered the beef teriyaki and chose the side of wasabi mashed potatoes. I felt so Provo getting mashed potatoes on the side, but I was intrigued by the addition of wasabi and was hoping for something spicy. The dish was served bubbling and hot (kind of like you may have been served fajitas before), and was fantastic -- the beef was tender, the sauce flavorful and not too salty, and I loved the vegetables it was served with. The wasabi potatoes were in fact not spicy, but were infused with a mild wasabi flavor. They went pretty well with the beef teriyaki, but would probably be weird with many of the other dishes they could accompany. The seafood tempura that Owen ordered was the biggest gamble -- I really wanted him to order something seafood because I am super picky about all foods from the sea. I hate anything that tastes remotely fishy or too salty, but I wanted to see if they were able to master seafood at a distance of almost 4,000 miles from the ocean. The verdict? Yes! It was amazing! 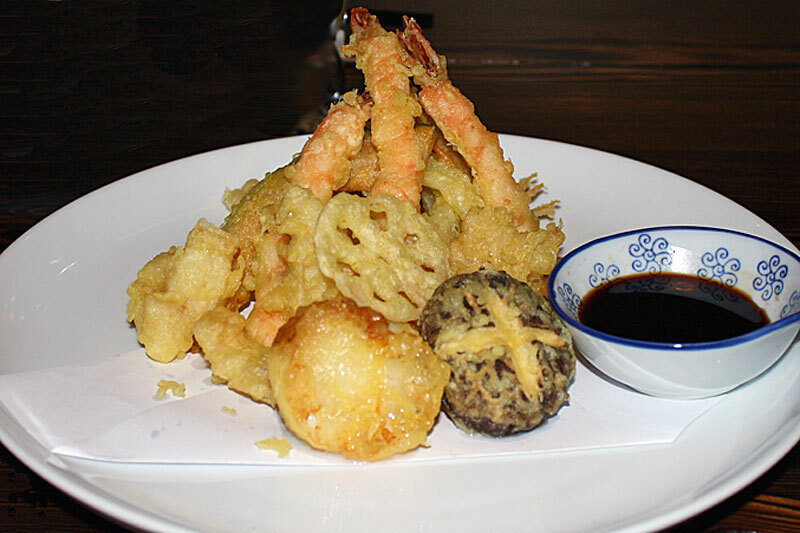 The seafood tempura contains the following: a large mushroom, 3 large prawns, a sea scallop, 4 pieces of suzuki (Japanese sea bass), 2 pieces of pumpkin, and onion rings, with a side of soy sauce and also rice. This photo really does not do it justice. The meal was artfully arranged and had great variety...best of all, it did not taste fishy! It was incredible! This was probably the best seafood I've had in Provo, and we couldn't get enough of it. The tempura batter was perfect -- you can tell that it is good fried food if you don't feel heavy and gross afterwards. 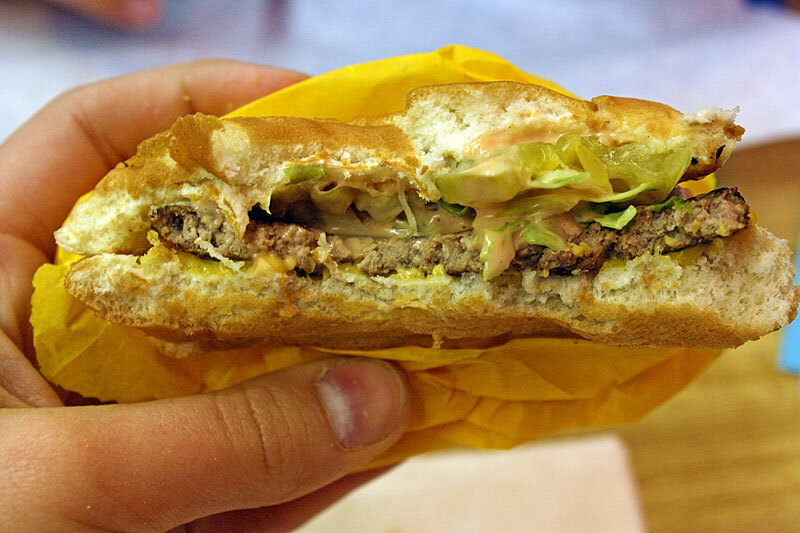 It was fried ideally at a very hot temperature, and was irresistible. The seafood skeptic in me was proven wrong. I would definitely order this again! What You Should Do: Go right now! Before it gets too popular and you won't be able to get a seat. Sora masters fusion Japanese dining better than anyone else around, and you are truly missing out if you don't go here! Next time I am definitely going to be more adventurous with my food choices, and I want to try some of their unique sushi options! Who Went: Chelsey, and all my bridal shower guests! 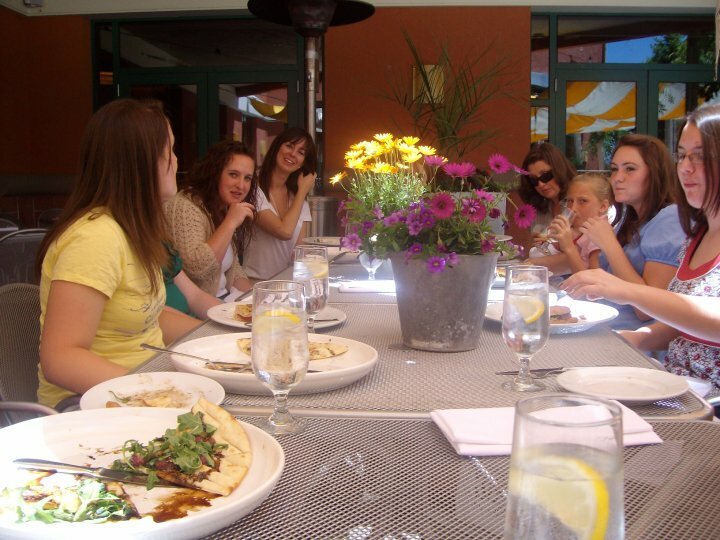 Just to mix it up a little bit, I thought I would share with you the restaurant where we had my bridal shower! I'm not a huge fan of toilet paper or bubble gum chewing games, so we decided to have a luncheon for my shower, and I wanted to go somewhere cute that had tasty food and lots of options. Cafe Trio definitely fit the bill! 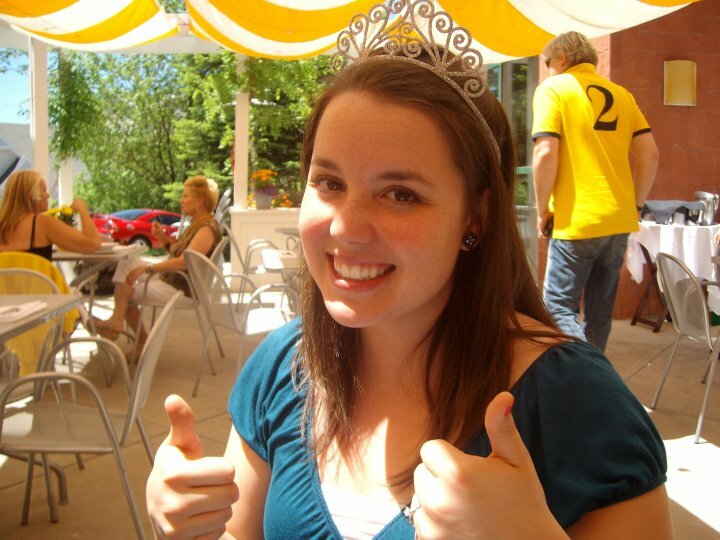 Here's a cheesy photo of me at Cafe Trio -- it was so fun to sit outside in their little yellow-striped covered area, and the service was excellent despite all the girls, separate bills, and present wrappings everywhere. Sorry, this is the only photo of the food that I was able to find, but let me tell you, it was delicious! They have a great selection of pastas, pizzas, paninis and more, all with unique and fresh flavor combinations. I ordered the three cheese ravioli with butternut squash sauce, and it was amazing. The sauce was rich, smooth and flavorful, and for once, I didn't feel lame ordering a pasta - I actually felt like it was worth it! The pizza in the corner was their cheese pizza. Have you ever seen a cheese pizza that looked more amazing? The prices weren't cheap, but for the fun environment, excellent service, and wonderful food, I definitely would say it's worth the trip! What You Should Do: Go right now! It's kind of out of the way, but I've been wanting to go back ever since my shower. I would love to try their dinner options, and their brunch menu looks AMAZING. They have a location in downtown Salt Lake as well, so you'll have to let me know if they are just as good! Congrats to Skylar and Kristin! 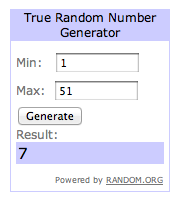 Please email me at chelsey@eatbyu.com in order to claim you awesome, super amazing prize! An African themed pizza place? An interesting fusion of cultures. Ideas of African safari adventures and a claim for healthy pizza were the two main draws when we visited Malawi's Pizza. Sadly, we found that the food was of course not African at all, just the decor but they do aim to give one healthy meal to a child in Africa for every meal that is purchased. According to their website five minutes ago, they have given away 115,117 nutritious meals to children in Malawi, Africa. I'm always a sucker for a good cause! The salad was decent. 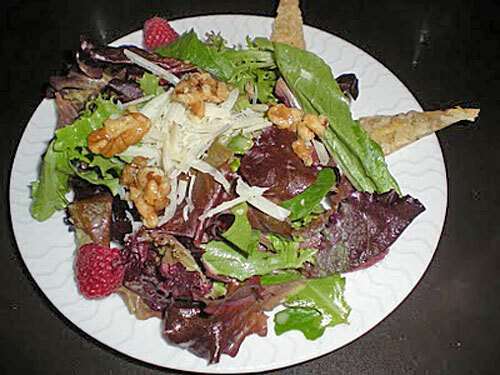 I was a little disappointed in the quantity of fruit in the self-proclaimed "Apple & Berry salad"--there were TWO thin slices of a Granny Smith tucked into the salad, and four raspberries. A little weak. But the flavor of the dressing was good, and my favorite part was the candied walnuts. We only got this because it cost $4 when you ordered it with a pizza, and we wanted to have some variety. One warning: do NOT get the BLT salad! It was a joke. We saw a guy who had ordered it, and basically it was half a head of lettuce (not even chopped up) on top of some tomato slices with bacon bits sprinkled on top. Get this salad instead, or the Sesame Beef Salad. 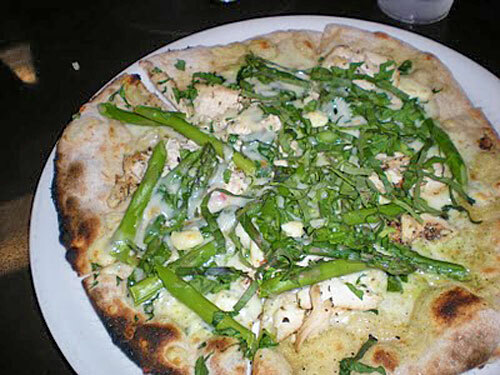 Should probably be renamed "Pizza with a Heck of a Lot of Asparagus on It." Seriously. This tasted pretty healthy and light, which was good, but it just seemed to be lacking. The pesto sauce was not very flavorful and was spread thinly, and the pieces of asparagus were so huge I could hard think about anything else while eating it. The chicken was good, and the Gorgonzola had a nice, robust flavor, but I was definitely missing the promised pesto flavor, despite the chopped basil. At least it looked pretty, green and healthy, right? 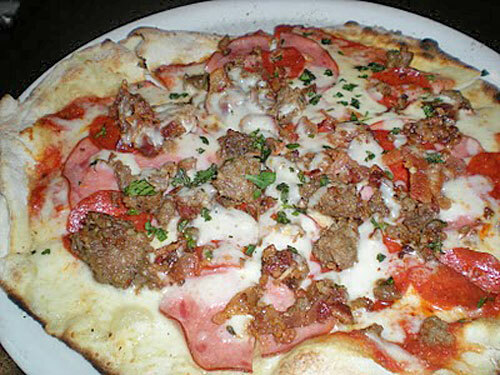 Both of us have very strong cravings for MEAT pizza every now and then--the more meat, the better! Owen was so mad at me for making him wait to eat this pizza until after I had taken a picture because it smelled so good. It pretty much lived up to our expectations except one thing: the bacon. What is the deal with everyone putting way too much bacon on pizza these days? I mean, don't get me wrong, I enjoy bacon as much as the next person. But the flavor of bacon is WAY too strong and totally overpowered all of the other meats on the pizza. Next time, ordering it without bacon. Or at least half the bacon if you want to taste anything else. What You Should Do: Go. 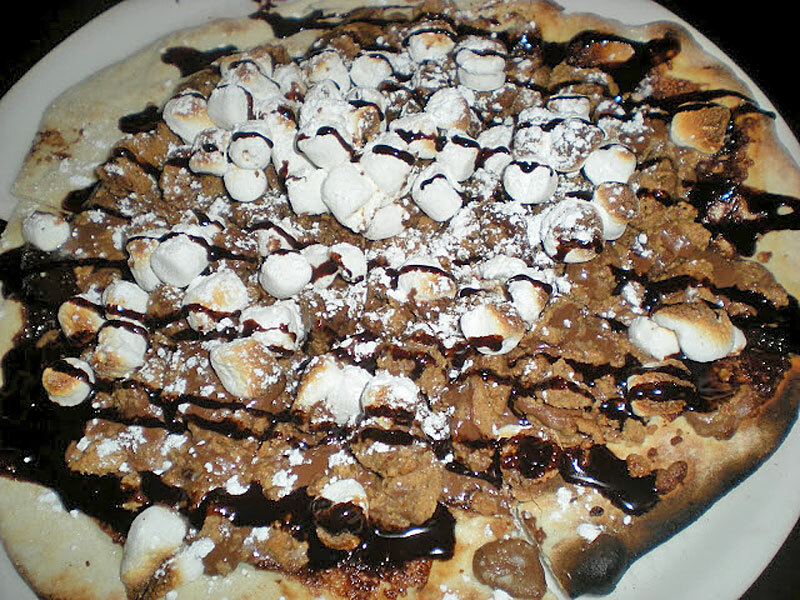 At least for the dessert pizza. I can't get that Reese's S'mores one out of my mind, and I saw someone with the Mixed Berry pizza nearby that also looked amazing. I would recommend going here often for the actual food since it was just okay and was kind of expensive, but at least you can feel awesome that not only did you get a meal, but you also helped donate one to a child in Africa.